There’s no better way to start off summer then with a read-a-thon! Enna Isilee at Squeaky Books is hosting this fabulous event. 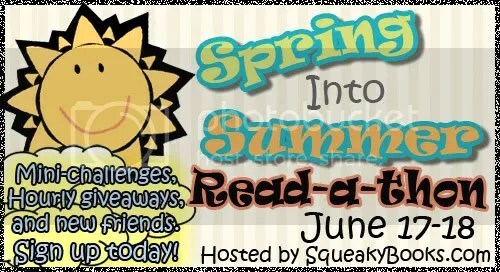 The read-a-thon starts Friday June 17th @ 8am MST Saturday June 18th @ 8pm MST. That’s thirty-six hours of non-stop reading! LOVE IT. Every few hours there will be mini-challenges, and a giveaway. You can win a bunch of books, and just for signing up, you’re entered to win a $25 Amazon gift card! I might add more, but this is my starting list. I have a few books I plan to pick up at the library this week. We’ll see if I add more. If you want to join in the fun, sign up here. This is awesome! I wish they did something like this where I live. I'm so jealous! Fun! I may have to sign up for this! This does sound like fun. I think I'll sign up too. I have a few books on my bookshelf that I can read but it's also an excuse to bye more. YAY me!!! go for it girls! I wonder how many I can read? If they are super intense, I'm thinking, maybe 3?